Scary Terry's World: Comics in the comics! The Archie gang rescues some vintage comic books and Fred Flintstone is distracted by the Sunday funnies. 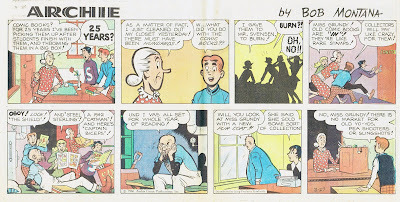 The comic book titles mentioned in the Archie strip are real comics at one time published by MLJ (also the publisher of the Archie titles) -- except for "Captain Biceps" -- that's just silly. 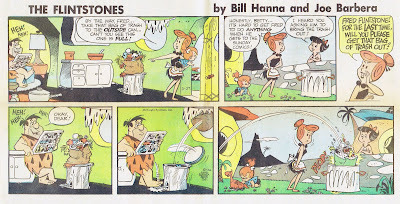 I'm told that Gene Hazelton was the primary artist on the Flintstones and Yogi Bear strips. Click on his name for more info. Big Funny is still on the way!